Christopher Herrick is renowned for his worldwide Organ Fireworks and Organ Dreams records. 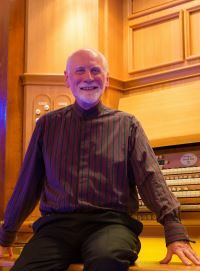 So, although he is beginning our 26th Anniversary Concert with a Sortie, he hopes you will stay for a recital which will certainly put the Binns organ through its paces. Versatile composer Ian Farrington treats us to a sequence of jazz/gospel variations on Amazing Grace, full of joy and optimism. Then it’s Liszt with his blockbuster Ad Nos piece, designed to show every facet of this organ and culminating in a spectacular chorale. The second half contrasts the optimism and nobility of Elgar’s march with the brooding Shostakovich Passacaglia, Shakespeare transplanted to the time of Stalin. Following Bach at his most noble we are sent on our way rejoicing with a tango.